Women's Health Devices Market size is set to exceed USD 42.5 billion by 2025; according to a new research report by Global Market Insights. Women’s health devices market is primarily driven by growing disease burden among women across the world. Growing number of gynecological cancers in developed as well as developing countries will surge the demand for advanced diagnostic and therapeutic devices thereby augmenting women health devices industry growth. Increasing disposable income coupled with advancements in healthcare infrastructure will drive the business revenue. Devices segment was valued over USD 15 billion in 2018 and will witness significant growth in the foreseeable future. High incidence of chronic and infectious diseases among the female population will surge the demand for effective disease treatment, thereby fostering the segment growth. Technological advancement coupled with availability of minimally invasive technologies will further spur the segment size. Female sterilization segment held considerable revenue in 2018 and is projected to show more than 6.7% CAGR during the analysis timeframe. Segment growth is attributable to growing inclination of females towards sterilization procedures to avoid the risk of unwanted pregnancy. According to the National Center for Health Statistics (NCHS) data, out of the total women opting for some type of contraception, more than 18.5% women chose female sterilization between 2015 and 2017. Increasing demand for permanent contraception will increase thus fuel the female sterilization segment growth. 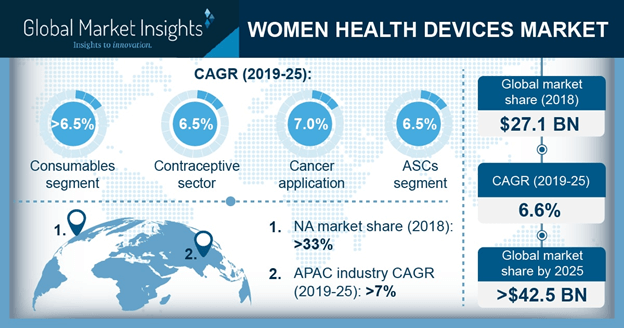 North America women’s health devices market was valued more than USD 9 billion in 2018 and is estimated to grow exponentially over the forecast period. High prevalence of cancer in the region is the prime factor driving regional industry growth. According to the American Cancer Society, in 2019, approximately 891,480 new cancer cases are estimated among female population in the U.S. Increasing demand for technologically advanced diagnosis and treatment options will foster the North America women health devices industry growth. Eminent industry players operating in women’s health devices market include Cardinal Health, Abbott Laboratories, Koninklijke Philips, CooperSurgical, F. Hoffmann-La Roche, Caldera Medical, GE Healthcare, Carestream Health, Hologic, Siemens, MedGyn Products, Prestige Consumer Healthcare and Medline Industries. Industry players adopt strategies such as geographic expansion, merger, acquisition as well as novel product launch to sustain market competition. For instance, in November 2016, Hologic launched next-generation NovaSure, an advanced global endometrial ablation system used in the treatment of abnormal uterine bleeding. This product launch enabled company to broaden its product portfolio and gain more market share.